Useful, informative & fun too. 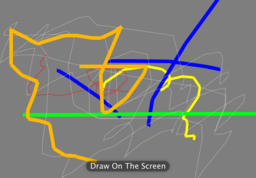 A good way to show how to draw GL Line Structure based Lines using an Iterator based setup. I know what you mean (it's a wording thing), but just to be clear for others reading, GL Line Structure, or any plugins, aren't used; it's the stock line patch doing the work. Glad you think it's useful! I thought it would be cool to show how to do this without plugins. I put this together when I was making the "infinite loop" qtz... it hadn't really occurred to me before. I was playing around with it some with morning coffee and thought the results from going ahead and patching in another queue to control start/end color looked really cool, instead of limiting so that the same color feeds start/end. You can always get "monotone" by setting both color values the same. So, I edited, and re-uploaded. Yeah , the Kineme GL Line Structure would need a different setup to create the appropriate x,y,z structure members that patch needs from the data input. Good thing about such Stock patch constructs is that they can be easily adapted to using another positional item, Stock or non Stock patch based, like the Line Family , GL Line or GL Spline. Ideas: If you hook a small sprite to the first set of x/y/z structure index patches then you have the "gl point" effect basically. You can break something like an RSS string into a structure of letters and then "write" that structure of letters into fun line shapes. On the line thing, if you disconnect the end line points and leave it at 0/0/0 it makes a fun kind of fan line effect thing. (Or add in another line so that you trace the outside and have the fan effect too).